» Home » 2019 » February » 11 » How much microplastic is there in the BC marine food web? How much microplastic is there in the BC marine food web? 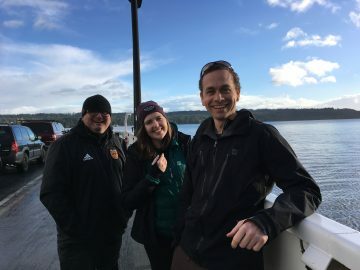 (left to right) The Microplastics team: Dr. Juan José Alava, Honorary Research Associate, Nippon Foundation-Nereus Program, IOF, UBC; Natalie Mahara, Research Technician; and Dr. Brian Hunt, Assistant Professor and Hakai Professor in Oceanography. Microplastics are one of the most pervasive global pollutants, and their presence in our oceans is a cause for great concern. As the name says, these are micro particles, less than 5mm in size, that have either been deliberately manufactured (e.g., microbeads in cosmetics), or emerge as larger plastics break down (nets, bottles, bags, clothing, etc.). They are roughly the same size range as plankton, and so when they show up in marine ecosystems they have the potential to be consumed by a vast array of organisms. The Institute for the Oceans and Fisheries (IOF)’s Dr. Brian Hunt and his team, in close cooperation with Dr. Juan José Alava, are concerned with the amount of microplastics that are consumed by zooplankton and herring. These are foundational species in the BC regional marine food webs, supporting many key species including salmon, seabirds, seals, sea lions and humpback whales. Moreover, herring represent a cultural, socio-economic and ecological key species for First Nations and coastal communities. Nowhere is this more significant that in Baynes Sound, in the Strait of Georgia, between Denman Island and Vancouver Island. It is a particularly important and sensitive ecosystem, listed as part of an Ecologically and Biologically Significant Area (EBSA) and Important Bird Area (IBA) in BC. This is based not only on the number of shellfish aquaculture facilities in the area, but also on its unique ecological features, including being a critical region for herring aggregation, spawning and rearing, and as a stop over for migratory shorebirds (e.g., the western Sandpiper). And it is here that Dr. Hunt with his team and Dr. Alava are focusing their research. “We also intend to learn more about the composition of the microplastics we find in the water and biota. Understanding the size, shape, and color classification of these items will provide first order information on where the microplastics have come from.” says Alava. Depending on their findings, the team would ultimately like “to assess the chemical makeup of microplastics found in the water column and organisms sampled (zooplankton and herrings) using a forensic approach (like looking at fingerprints to identify the cause or culprit) with a high-resolution machine (Fourier-transform infrared spectroscopy (FTIR)) to identify the major potential sources of microplastics to Baynes Sound” said Alava. 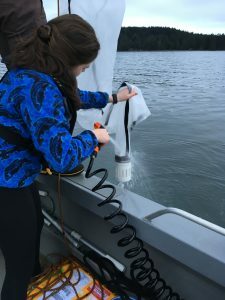 The team will collect samples in Baynes Sound from March to June; the time when the herring will gather, spawn, produce larvae, and also when the spring zooplankton blooms. Juvenile herring will be sampled in September in collaboration with Dr. Jennifer Boldt from the Department of Fisheries and Oceans. The team expects to release their findings, and to make a database available online, by the end of 2019. A similar study in the Baltic Sea found microplastics in 20% of forage fish, including herring (Beer et al., 2018). 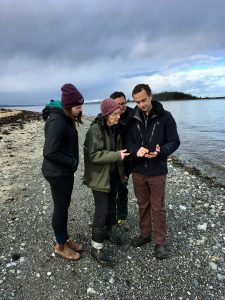 One previous study measured high densities of free drifting microplastics in the Strait of Georgia, while extremely high concentrations have been measured in Baynes Sound sediment. There is a high probability of exposure to, and consumption of, microplastics by zooplankton and herring in Baynes Sound. This study will fill this knowledge gap and provide a baseline that can be compared with regional and global trends. 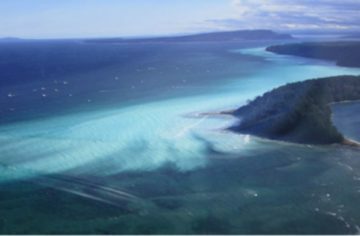 It will also provide baseline information on microplastic pollution in Ecologically and Biologically Significant Areas (EBSAs). 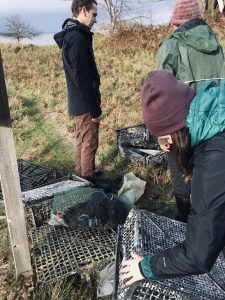 “This research will contribute essential information to support eco-toxicological risk assessment and potentially inform a plastic waste management plan for Baynes Sound,” said Alava. This Project was partially supported by a financial contribution from Fisheries and Oceans Canada through its National Contaminants Advisory Group; in kind contributions from the citizen scientists and members of the Association for Denman Island Marine Stewards, led by Dorrance Woodward; in kind contributions from the K’omoks First Nations; and Dr. Hunt’s NSERC Discovery Grant. Natalie Mahara (M.Sc.) – Research Assistant. Photographs © Colette Wabnitz (except where otherwise noted).